Oswald was of a noble Saxon family; he was endowed with a very rare and handsome appearance and with a singular piety of soul. Brought up by his uncle, Saint Odo, Archbishop of Canterbury, he was chosen, while still young, as dean of the secular canons of Winchester, at that time very lax. His attempt to reform them was a failure, and he saw, with that infallible instinct which so often guides the Saints in critical times, that the true remedy for the corruption of the clergy was the restoration of monastic life. He therefore went to France and took the habit of Saint Benedict. When he returned to England it was to receive the news of Odo's death. He found, however, a new patron in Saint Dunstan, Archbishop of Canterbury, through whose influence he was nominated to the see of Worcester. To these two Saints, together with Ethelwold of Winchester, the monastic revival of the tenth century is mainly due. Oswald's first care was to deprive of their benefices all disorderly secular clerics, whom he replaced as far as possible by religious priests. He himself founded seven religious houses. Considering that in the hearts of the secular canons of Winchester there were yet some sparks of virtue, he would not at once dismiss them, but rather reformed them through a holy artifice. Adjoining their cathedral church he built a chapel in honor of the Mother of God, causing it to be served by a body of strict religious. He himself assisted at the divine Office there, and his example was followed by the people. The canons, finding themselves isolated and the church deserted, chose rather to embrace the religious life than continue to injure their own souls, and be also a mockery to their people, through the contrast offered by their worldliness and the regularity of their religious brethren. 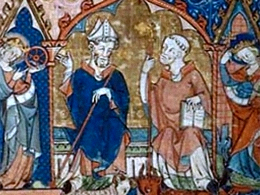 Later, as Archbishop of York, Saint Oswald met a like success in his efforts. God manifested His approval of his zeal by discovering to him the relics of his great predecessor at Worcester, Saint Wilfrid, which he reverently translated to the church of that city. He died while washing the feet of the poor, as he did daily during Lent, on February 29, 992. Reflection. A soul without discipline is like a ship without a helm: it must inevitably strike unawares upon the rocks, founder on the shoals, or float unawares into the harbor of the enemy. *On leap years, the feast day of this Saint is celebrated on February 29. Wide is the gate and broad is the way that leads to destruction, and many there are who enter that way.